Country Deli owners Mark and Carla Hutchins at their newish location. I work from my home/studio, so lunch options tend toward leftovers, a nuked sweet potato or lately, salads from whatever is in the lettuce locker. But in trying to keep a finger on the pulse of the OBX restaurant scene, and with summer winding down, I came up with a grand strategy. It would be bold. It would be decisive. It would be extraordinary. It would also keep The Voice editors at bay because I’m a little bit late. In this perfectly executed plan, I would, in three days, have lunch in three establishments and each would be my first visit, sort of. I’ll explain as we dive in. 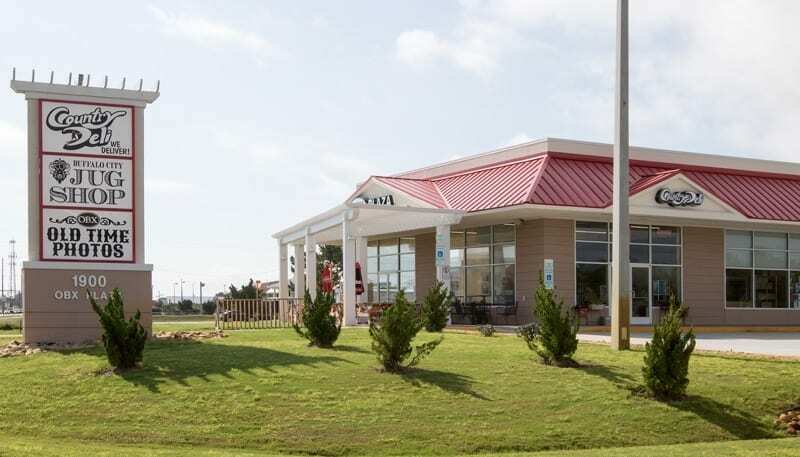 OBX Plaza, a new building, houses Country Deli as well as the Buffalo Jug Shop and OBX Old Time Photos in Kill Devil Hills. First off, I have indeed enjoyed a sandwich or three at Country Deli before, but not at their new location. 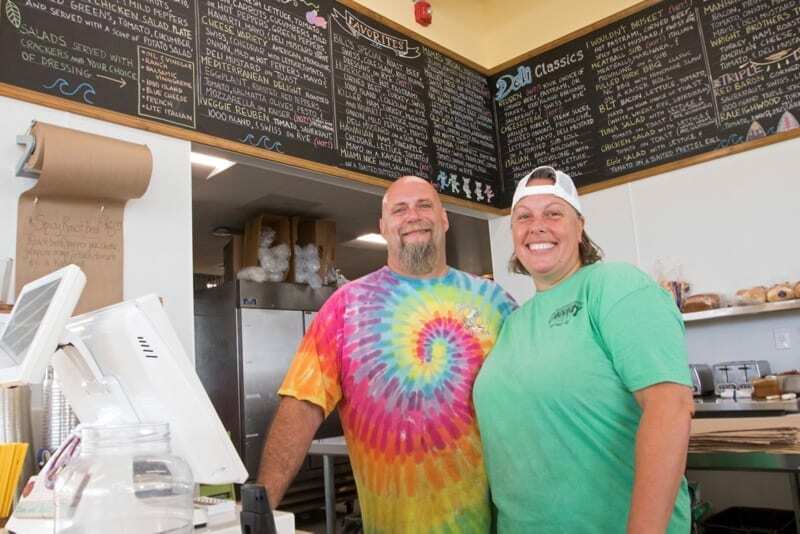 This well-known and much-loved sandwich shop had been operating since 1990 at its Surfside Plaza location in Nags Head. The old store was cozy, almost too cozy for the business they were doing, and so expansion seemed the way to go. At first they considered building into an adjacent space. 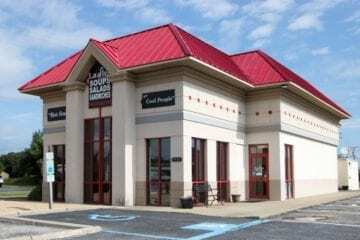 But an opportunity arose and the owners, Mark and Carla Hutchins, made a more dramatic move. On June 23, 2017, they opened shop in a brand-new building, the OBX Plaza, at 1900 S. Croatan Hwy. in Kill Devil Hills. 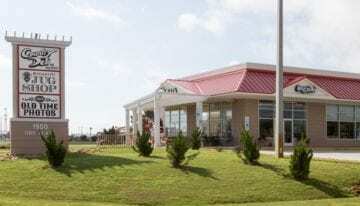 Country Deli is now much more conspicuous, with frontage on the busy U.S. 158 Bypass. The same complex also is home to the Buffalo City Jug Shop and OBX Old Time Photos. The much larger space still has a friendly vibe, and enormous chalkboards carry the extensive, sandwich and salad menu. Plenty of seating is available, including an outdoor area that allows folks to sit and linger, rather than having to grab and go. The I Wouldn’t Brisket sandwich of pastrami, corned beef, Swiss cheese and deli hot mustard on rye, complemented with chips and a dill spear. Mark Hutchins says they are enjoying the increased elbow-room and with the better part of two summers under their belts now are past the bumps that any new facility presents. And then there are the sandwiches. The “Manhandler” is a meat lover’s dream, stuffed with a righteous pound of protein. Triple-deckers are a real thing here and there is one called the “Raleighwood.” This is a turkey, salami, lettuce, tomato, mayo and mustard sandwich “sandwiched” between two other grilled cheese sandwiches. Here, sandwiches are crafted, but constructed may be a better term. These were tempting, but I aimed a little lower. Not wanting to become the ever expanding-man, I picked out the heated “I Wouldn’t Brisket” sammie of hot pastrami, corned beef, spicy mustard and Swiss on rye. It arrived as I had imagined, plump and delicious. The meat perfectly spiced, the cheese melted perfectly, the rye stood up to the deli mustard quite well. I’m a big guy and I didn’t need any more sandwiches surrounding that one. 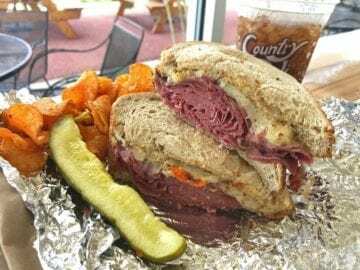 One naturally thinks in terms of meats for a deli, but a good part of the menu provides options for veggie lovers and folks seriously considering salads. (I miss The Sopranos so much.) In fact, you can go to their website and see the full menu broken down to 13 sections for ease of perusal. This also comes in handy since Country Deli delivers to hungry folks between mileposts 5.5 and 17. Just give them a call. Catering with Country Deli is also an option with a variety of party trays, brownie platters and tea by the gallon. Tuesday thru Saturday, 10 a.m. to 8 p.m.
Day Two had burger written all over it. I can’t say why, but it did. It also had beer penciled in there in the margin. No clients to greet in the afternoon and no planned handling of heavy machinery gave me a clear conscience to tipple a little at lunch. 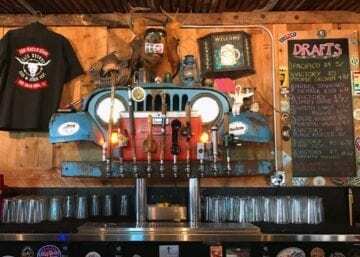 Jack Brown’s Beer and Burger Joint is a new place in Kill Devil Hills and among burger fans, has generated a bit of a buzz. So I was anxious to give them a try. Happy to refer to itself as a “joint,” the sign out front appears old and a tad stained and weathered. The door has the hours spray painted on it. This is a little different. The stuff can include, among other things, a mounted elk head with a beer can in its mouth, lots of rusted corrugated tin and the front end of a jeep. The bar balances on rows of old lockers covered with stickers. The place is funky and friendly with a dose of whimsy. 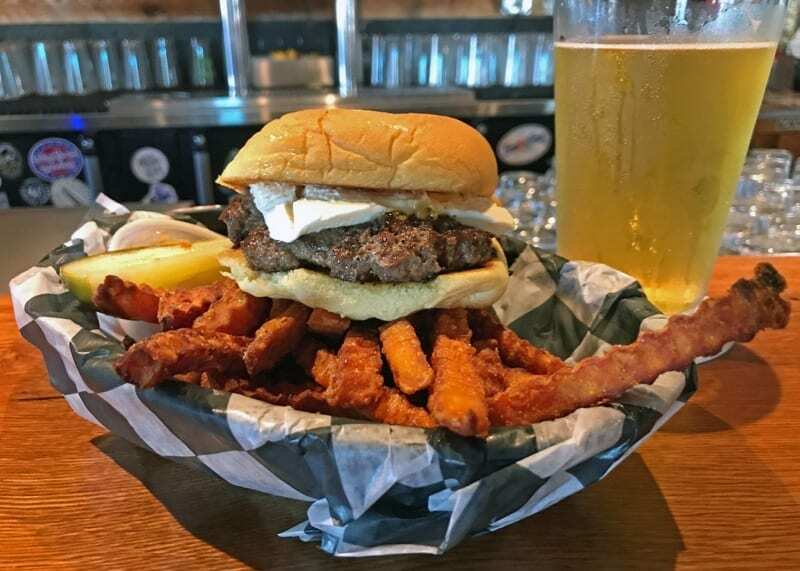 The Cobra Kai burger with pickle, sweet potato fries and a cold draft. The ten draft tap handles are made up from bits of fishing rods, an old telephone handset, a Kodak Instamatic camera and a flashlight. Rusted metal doodads like model ships and lanterns are abundant. One can wonder how it is all held together. Jack Brown’s Beer and Burger Joint is the brainchild of two buddies, Aaron Ludwig and Mike Sabin, according to their website. Ludwig has a background in the ski and snowboard business and a nose for craft beers. Sabin hails from the restaurant world. The story is they sought to create a place they would be comfortable in, and where they could eat the burgers they craved and the beers they enjoyed. Next thing you know, old Jeep parts, crates of beers and buckets of waygu beef spilled out into 12 operations across the “Northern South.” That isn’t a bad thing. A good idea has every right to get itself out there in the markets where it fits. Here, it occupies the building that was most recently the lodge of the Fraternal Order of Eagles, which has since moved on to a spot in Nags Head. So I asked and received a cold Noble Standard Bearer and that first sip set me at ease. Sitting there, taking it all in, the collective effect works. But my main quest was a burger, and I this would be a serious burger. Jack Brown’s takes great pride in only offering Wagyu beef. That is the American “Kobe-style” beef that comes from cross breeding Japanese Wagyu with American cattle. They source from the celebrated Snake River Farms in Boise, Idaho. Can you taste the difference? Yes you can. The beefy flavor is amped up and the texture is purely sublime. With so much emphasis on the quality of the beef, there is not much needed beyond a freshly buttered Martin’s potato bun and you can be pretty happy. Just don’t ask for tomato and lettuce. Another point: The burger you order will not be one of those 6-pound greasy landslides you see on Instagram. The burgers are portioned to a quarter pound, but ask for a double or triple if you desire. They will accommodate. Beyond this, you can have a lot of fun with toppings. The menu lists a dozen and a half or so combinations. I decided on the “Cobra Kai” burger with cream cheese, pickled jalapeños and jalapeño pepper jelly. It was very satisfying. It took me back to the days when company would show up unexpectedly, and my aunt would smear pepper jelly over a brick of Philly cheese and call that a dip. Toppings can vary by location, but I found “The Elvis” to be intriguing, with peanut butter, mayo, bacon and cheese. Also of interest is “The Shocker” with fresh jalapeños, fresh habaneros, pepper Jack cheese and shocker sauce, which I am fairly certain is hot. Go bananas and sub out that potato roll with a glazed donut. Yes, that is a thing at Jack’s. 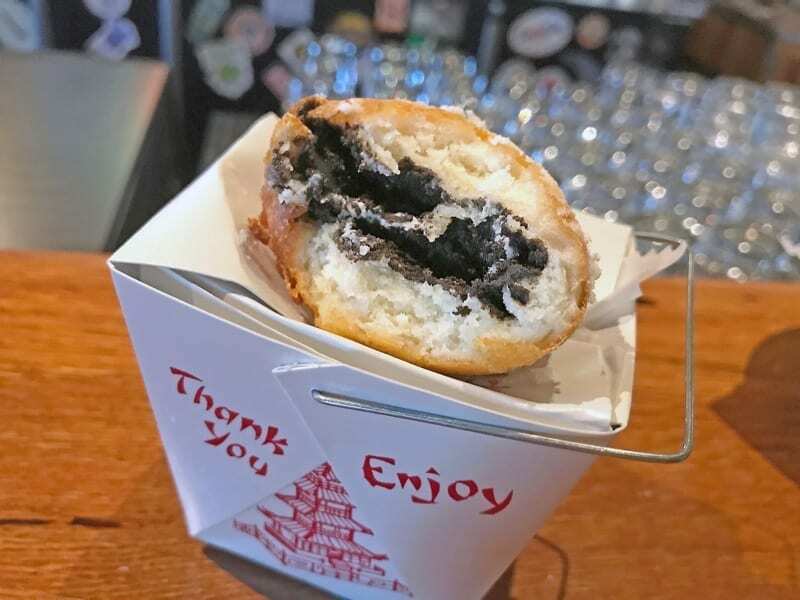 Crinkle cut Yukon or sweet potato fries make a formidable backup on the plate and to finish things off, have a fried Oreo for one dollar a pop. Ladles Soups occupies the site of the previous Arby’s in Kill Devil Hills. So day one and two of my journey certainly had a lot of meat on the menu. It was time to get my fiber on. I turned to Ladles Soups (Hot Soup for Cool People) in Kill Devil Hills and took my place in line with a steadily streaming lunch crowd. I had my eye on a two-top by the front window and hoped it stayed unoccupied while I waited to place my order at the counter. There, I made my selection and paid, got my metal number tag, and filled my drink cup. After a short time, a server brought my salad and soup. I was taken aback at the size of the salad. If I had not been so hungry it would have been plenty for two. 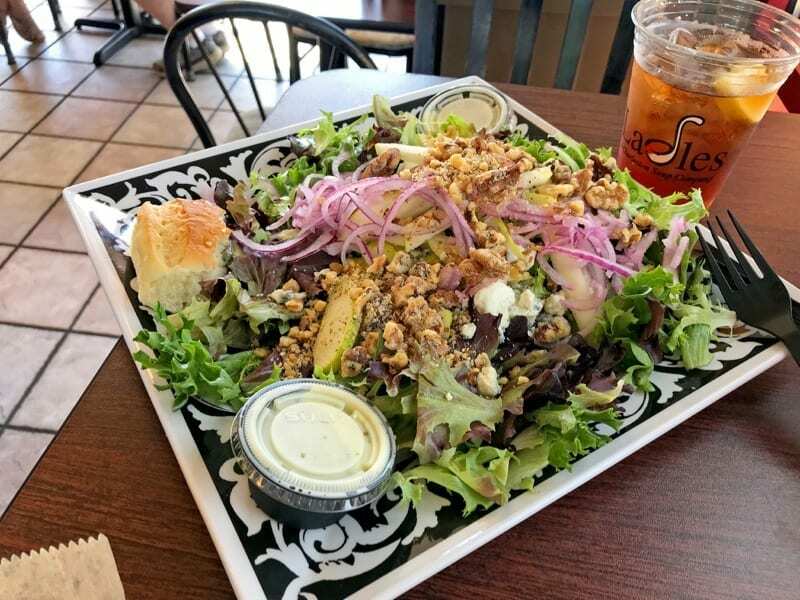 The Pear and Walnut salad, with blue cheese red onions and champagne vinaigrette. Snappy greens, crisp sliced pears, nuggets of velvety bleu cheese and a dusty covering of candied walnuts was laid before me and I wasn’t in the sharing mood. The amount and quality of the ingredients justified the price. For just a dollar more I paired this with a cup-sized portion of the cool cucumber and dill soup. I was pretty much in heaven. Note these particular dishes are seasonal. Laurie Harvin is the local owner and this marks the fifth year for the Outer Banks location. Like Jack Brown’s, they are a concept restaurant with several local owner operated locations. 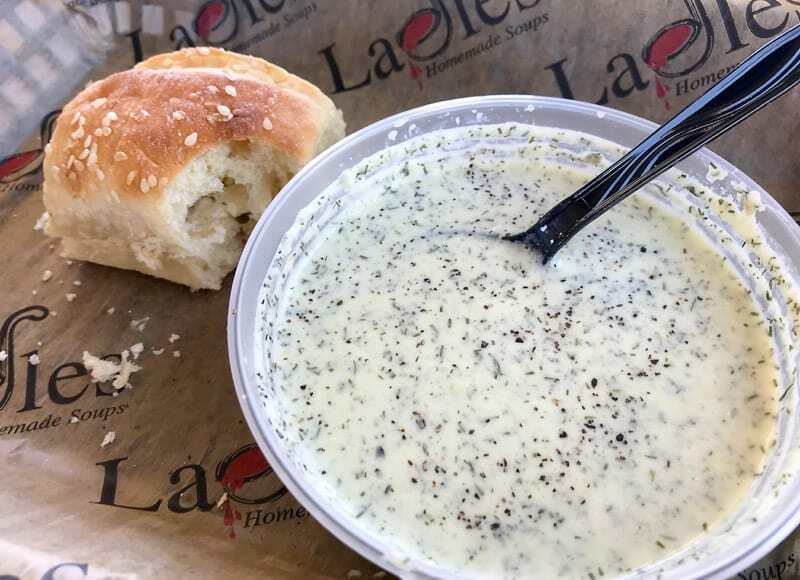 The idea for Ladles Soups, according to their website, was conceived on a road trip from Houston to Dallas. I can believe that. I suppose they weren’t finding what they were looking for amid the hundred barbecue shacks along that route. Chilled Cucumber and Dill soup. With time, the company has developed not only special sandwiches and salads but over 400 soup recipes that rotate regularly. If you are hungry and curious, check their Facebook page for the daily and special offerings of soups, salads and sandwiches. I’m looking to return to try the gulash. Or maybe I’ll try the Greek Lemon Chicken Soup, if not the Herb, Cream Cheese and Veggie on Rye sandwich. Decisions. Here’s the thing about going out for lunch; it is a needed pause in the day. It is an oasis in a hectic sea of shifting sands. In some cultures, it is the main meal of the day and is followed by a period of rest and therefore, rejuvenation for one to handle the remainder of the day, and into the night. It can also serve as a pressure relief valve. Still boring holes in the back of your work mate’s head? Step out. Take a breath and have a sammich. The day will improve. So I invite my fellow area inhabitants to seek out those places you have shied away from, squeeze in a few extra minutes, and wade into the possibilities of the mid-day meal. love it! Great reviews of great places!